Mass alerting ensures that hospitals have a reliable way to communicate to all users, or to specific groups of users instantly. Telmediq does not have restrictive caps on the number of messages that can be sent at once so that critical messages can be acted upon in a timely manner. Broadcast messaging allows critical alerts to be sent to specific groups of users, such as a “stroke team” broadcast or “Ward 3 RNs” broadcast. Care teams can be effectively mobilized based on-call schedules, with automatic escalation to activate backups if not read within a certain amount of time. Messages can include response options and information about sent / delivered / read status and patient information in the message such as, “Duncan Harris, male, age 29, indicators 5, time to ED 10 minutes.” Telmediq offers pre-configured message replies for quick responses such as “Accepted” or “I’m on the way”. 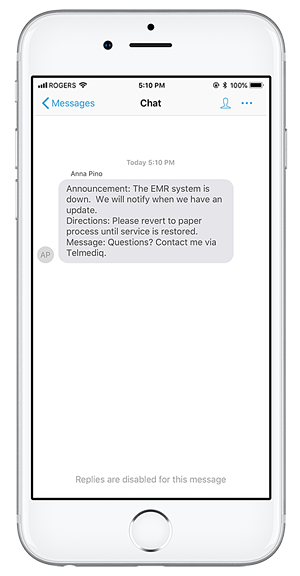 When every second counts, Telmediq can help improve your clinical communication & coordination efforts. To learn more about the unique and recurring use cases of Telmediq in acute and ambulatory settings, download our Guide.